Our neighbor Jason is the Artistic Director over at Three Cat Productions. They do three main productions a year and have two free monthly events for the neighborhood. They are having an event this Friday evening with an exceptional group of performers. If you are interested in checking it out, see Jason’s note below. (Chicago, IL) Three Cat Productions celebrates Chicago based performers with Cabaret on the Lake. Cabaret on the Lake is a free monthly variety show featuring storytellers, performance artists, singer-songwriters, comedians, and more. The event is held on the second Friday of each month at the Berger Park Cultural Center (6205 N Sheridan Road). This month’s event will be held on Friday, April 10 at 7:30pm. Tickets are free. Hosted by Rob Dorn. April’s Cabaret on the Lake outstanding performers include Brittny Congleton, Ruth Kaufman, James Robinson-Parran, Lisa Scott, and David Sherman. Cabaret on the Lake is part of Three Cat Productions, Edgewater’s Artists Incubator program. Three Cat Production is committed to creating exciting opportunities for artists of all types and the development of new work. In 2014, Three Cat Productions provided opportunities for over 250 artists in the Chicago area. Brittny Congleton is a big haired comedic songstress, hailing from Kentucky, but has loved calling Chicago her home! Performing regularly with Chicago Kids Company, HEY LADIES, an all female Southern musical sketch comedy troupe she co-founded, and being a regular host & variety act with Vaudezilla Burlesque and Cabaret keeps this goofy gal pretty busy. Ruth Kaufman‘s true, short story, “The Scrinch,” is in St. Martin’s anthology The Spirit of Christmas, foreword by Debbie Macomber. Writing accolades include: 2011 Golden Heart® winner, runner up in RT Book Reviews’ national American Title II contest and a 2012 Indie Excellence Award for her co-auhtored roadmap to greater self-esteem. Find Your Inner Fabulous. An attorney with a Master’s in Radio/TV, Ruth is a Chicago on-camera and voiceover talent, freelance writer and editor and workshop presenter. James Robinson-Parran has been active as a composer, conductor, pianist, songwriter and soloist. 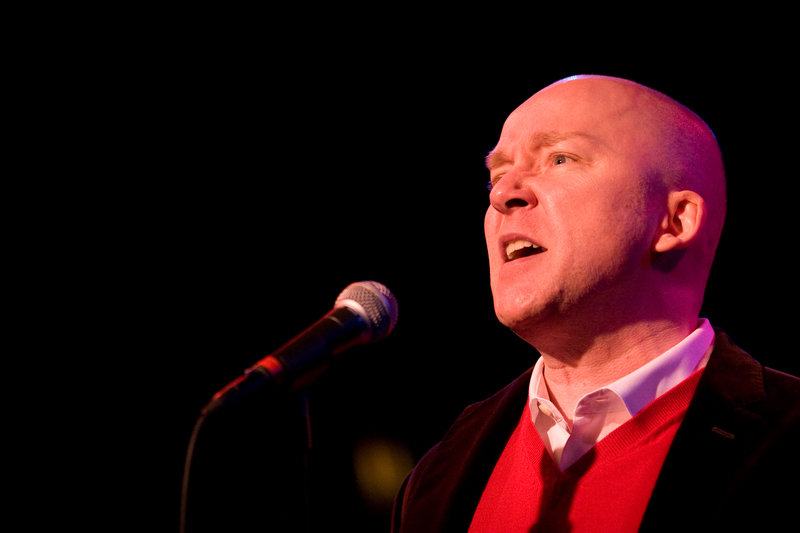 Some notable experiences include commissions by the Chicago Composers Forum, several appearances as principal conductor, pianist, and vocal soloist with Friendship Baptist Church in Chicago, an appearance with the Jazz band of Morgan Park High School at the Chicago Jazz Fest, as well as work with Circle Theatre, Open Door Repertory Theater, the Jeff Kowalkowski Ensemble, Lucky Pierre, and many others. Most recently, James has shared the stage with legendary folk singer Anne Hills, and Paul Amandes in two stage productions of “Local Wonders: Seasons in the Bohemian Alps” based on the book by former U.S. Poet Laureate and Pulitzer prize winner, Ted Kooser. Lisa Scott is a Network Playwright at Chicago Dramatists. Tell Me When It Hurts was originally developed in a Chicago Dramatists workshop with Stage Left Theater. Her play-in-progress, La Familia Dune, was part of the 2013 Chicago New Work Festival. Scott also is a storyteller and has been seen at Here’s The Story and This Much Is True. She is a graduate of Northwestern University’s Medill School of Journalism. David Sherman is a singer, composer, actor, writer and recovering fitness junkie. He has studied improvisation at I.O. and Second City. He wasted his youth touring the country with the world’s greatest mambo rock band. He is currently wasting his time performing with The Swing Shift Orchestra and his original glam-pop band, The Steak House Mints. He has written a children’s book and for a variety of live productions. He is currently writing a musical. His hobbies include waiting patiently and punctuation? Host Rob Dorn most recently appeared as Jacey Squires and top tenor in the Barbershop Quartet in Paramount Theatre’s critically acclaimed production of “The Music Man.” He has performed in hundreds of theaters across the country, including The Repertory Theatre of St. Louis, Hey City Stage, Minnesota Orchestra and Carnegie Hall. Locally he’s worked with Silk Road, Three Cat Productions, Court Theatre, Wisdom Bridge, Apple Tree, Light Opera Works and Pegasus Players. He toured for many years with the pop vocal group, “Three Hits and a Miss” and currently sings with Alan Gresik’s Swingshift Orchestra at Chicago’s Green Mill. Rob is also an award winning Graphic Designer and Illustrator. Three Cat Productions’ 2015 season also includes the Cabaret on the Lake at the Berger Park Cultural Center on April 15th (and continues the second Friday of each month); Bab Fab, the 8th annual Barbra Streisand tribute benefit on April 25 at Stage 773; Chicago Is! , a hometown musical revue featuring Chicago’s top composers which runs April 30 to May 20, 2015 at the Berger Park Coach House Theater, and the Next Draft staged reading series on April 20 (and continues the third Monday of each month). Three Cat Productions was founded in 2007 with a mission to create connections between theater, music, audience and artists through the production of cabaret concerts, contemporary musicals and plays, the re-invention of classic work, the development of new works and new artists, and by creating educational and outreach opportunities for the Chicagoland community. Visit the web site at www.threecatproductions.com.